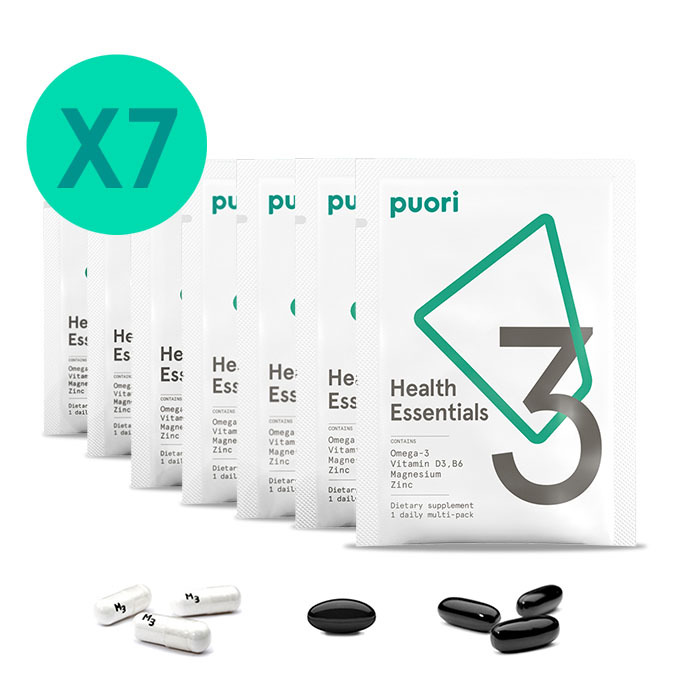 A Week’s Worth of Puori 3 Daily Packs for free (shipping $2.99). By ordering a free trial, you’ll be enrolled in a monthly subscription. Don’t worry ‑ you can postpone or cancel anytime. Try Puori 3 out for a week. We recommend taking it consistently so you get the full benefit. By ordering your free week, you’re enrolling in a Puori 3 subscription at $65 per month. Don’t worry — we’ll send you a reminder 3 days before it ships so you can postpone or cancel. The subscription is built to fit your lifestyle — cancel at any time or postpone your shipment. New to Puori? Try one week of our most popular product, Puori 3, for free. By ordering your free trial, you’ll be enrolled to our monthly subscription. Don’t worry – we’ll send you an email reminder with the option to postpone or cancel if you don’t love Puori 3 (although we’re sure you will!). Puori 3 combines fish oil, vitamin D3 and magnesium to give you a dose of vitamins and minerals that are often missing from our diets. This trio works together to maintain immune function, strengthen your bones, relax your muscles and help maintain a healthy heart and brain. Subscriptions are the best way to get premium Puori supplements conveniently delivered to your door. Our flexible auto-renew option allows you to choose your shipping date and you’ll always have free delivery. With benefits like loyalty points, insider gifts and exclusive sales, you get the best deal on Puori supplements so you can spend your time and money doing what motivates you.